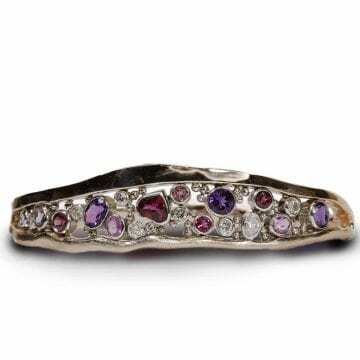 The custom multistone bangle bracelet from the River Collection features a combination of tourmaline, sapphire, garnet, tanzanite, amethyst & diamond. Designed & fabricated by Paul Richter. 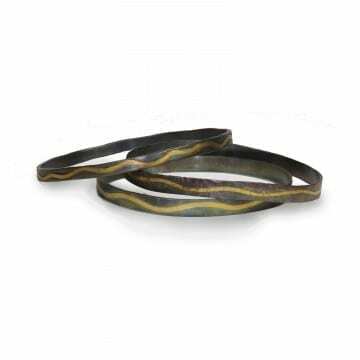 Oxidized sterling silver and 18kt yellow gold bangle bracelets. Each sold separately. The oxidized sterling silver and 14kt white gold blue topaz bangle bracelet was designed and fabricated by Paul Richter as part of the Pathways Collection. 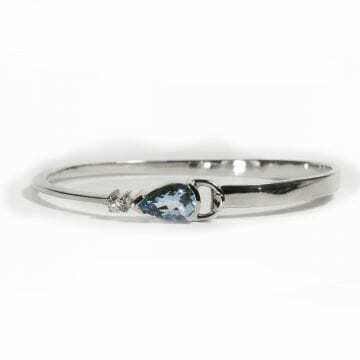 The bangle is bezel set with (1) oval blue topaz (6.65ct.) in the latch style clasp. The satin finished sterling silver and 14kt white gold blue topaz bangle bracelet was designed & fabricated by Paul Richter as part of the Pathways Collection. 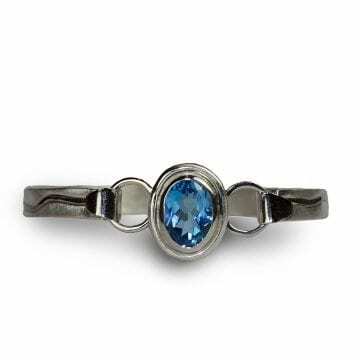 The 8" bangle is bezel set with (1) oval blue topaz (6.65ct.) in the latch style clasp. 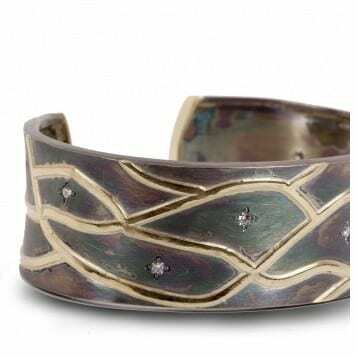 The oxidized sterling silver and 18kt yellow gold cuff bracelet is flush set with round brilliant cut diamonds which have a carat weight of 0.76ctw. The oxidized sterling silver and 18kt yellow gold cuff bracelet is flush set with eleven round brilliant cut diamonds which have a carat weight of 0.49ctw. 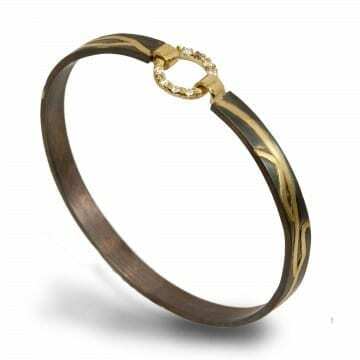 The oxidized sterling silver and 18kt yellow gold bangle bracelet is set with eight round brilliant cut diamonds that have a carat weight of 0.20ctw. 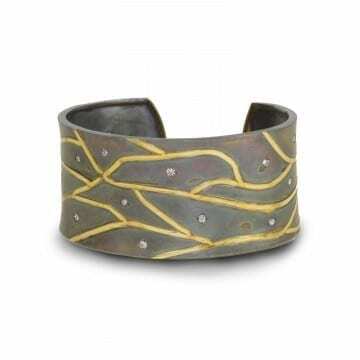 The oxidized sterling silver and 18kt yellow gold diamond bracelet was designed & fabricated by Paul Richter as part of the Pathways Collection. The bracelet is a cuff style set with (11) round brilliant cut diamonds that have a carat weight of 0.28ctw. 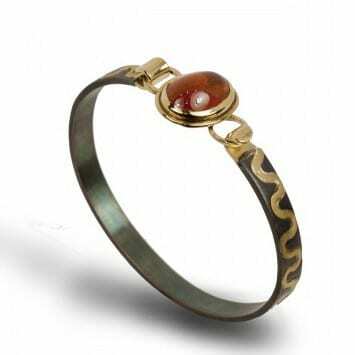 The oxidized sterling silver and 18kt yellow gold bangle bracelet is set with one spessartite garnet which has a carat weight of 11.35ct. 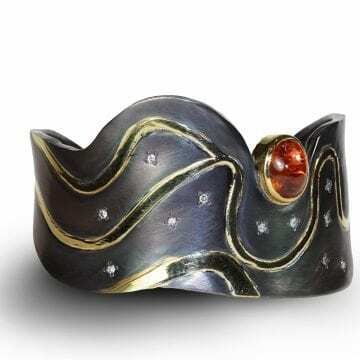 Oxidized sterling silver and 18kt yellow gold spessartine garnet and diamond bracelet designed and fabricated by Paul Richter as part of the Pathways Collection. 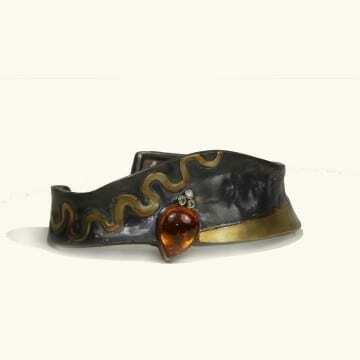 The bracelet is bezel set with (1) oval spessartite garnet that has a carat weight of 9.81ct. The garnet is accented by (13) round brilliant cut diamonds that have a carat weight of 0.26ctw.